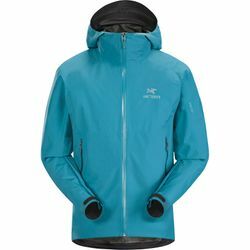 ARC'TERYX Zeta SL Jacket. Summer hiking and trekking involves unpredictable mountain weather. The Zeta SL Jacket is designed specifically as an emergency shell for hiking. It packs up small so it's ready whenever sudden storms arise. This superlight, packable, emergency waterproof jacket is made from GORE-TEX fabric with Paclite Plus product technology. The minimalist design and fully articulated patterning gives an exceptional fit and freedom of movement. Featured with a WaterTight front zipper and two hand pockets with RS sliders. The non-helmet compatible StormHood secures with a halo adjuster. The adjustable cuff and hem help seal out the weather.